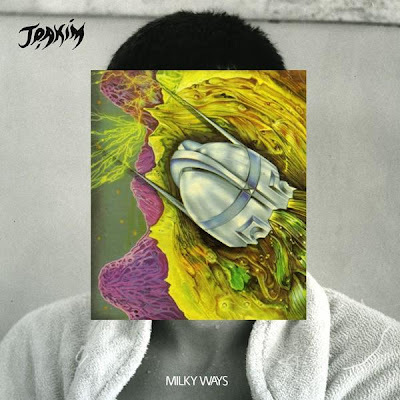 Frenchman Joakim who had that great poppy track you may remember 'Lonely Hearts' releases his much anticipated follow-up album Milky Ways today! It is definitely more experimental and darker than I remember him being, but that's a good thing! Really digging the live video he has for album opener 'Back to the Wilderness' were he's rocking it live with his band. Sounds very raw and makes me crave seeing them perform live. Must be intense! Their record label !K7 is holding a special contest for their next single from the album 'Spiders'. They want their fans to get involved and maybe be included in their next video! Here's the info they sent us just in case there are any rock stars in waiting out there. This might be your big break! 'WE WANT YOU TO MAKE YOUR OWN INTERPRETATION OF 'SPIDERS' AND TO MAKE A VIDEO OF YOUR PERFORMANCE. YOU MAY SING THE SONG, ALONE, WITH YOUR SISTER, WITH YOUR PET, PLAY THE SONG WITH A BANJO OR A TRUMPET, DANCE TO THE SONG, WHISTLE THE MELODY, DO AIR GUITAR OR WHATEVER. YOU MAY USE A PROFESSIONAL CAMERA AS WELL AS A CHEAP PHONE TO SHOOT THE VIDEO. WE WILL ACCEPT THESE VIDEO FORMATS : MOV, AVI, MP4, MPEG. ALL VIDEOS MUST BE SENT BEFORE THE 5TH OF OCTOBER. THE BEST VIDEOS WILL BE EDITED AND INTEGRATED IN THE FINAL SPIDERS VIDEO. A KARAOKE VIDEO OF SPIDERS TO HELP YOU SING IT. Good luck! I hope some of our readers win! In the meantime here is that video I was talking about for 'Back to the Wilderness' plus 'Travel in Vain' one of my faves from the album and a sweet Metronomy Remix of 'Spiders'. What is this? A post about Joakim that wasn't written by me? hahaha I know I haven't posted in a while but how about that mix from Sunday? What no comments?!?! Lazy readers! Drop us some love! Anybody speak French? (Ray, doesn't Joakim look like Alex?